We welcome you to join our environmental efforts of 'Saving the Planet One Driveway at a Time' by becoming a member of our affiliate network and starting an EcoSeal® Franchise of your own. Help spread the good news: Eco-friendly products are now available... make the switch to safer and cleaner pavement products today! Join our EcoSeal® affiliate network and start your own Franchise by purchasing the EcoSeal® Franchise Marketing Kit containing custom, high-end marketing materials using the established EcoSeal® national brand. 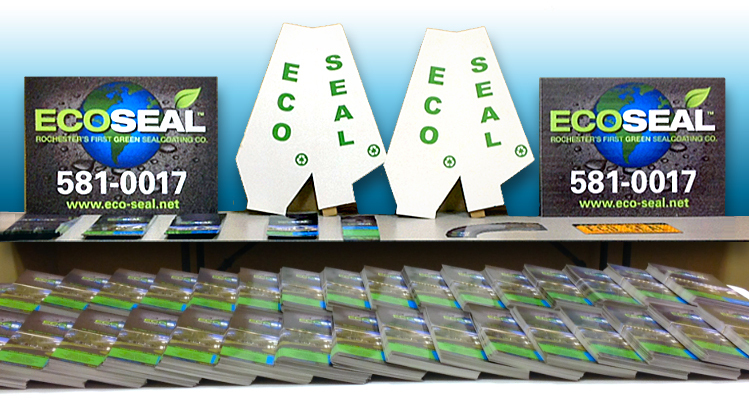 The Marketing Kit includes all the materials you'll need to quickly setup your own EcoSeal® affiliate branch. To sign up, please email us with your request and contact info at: info@eco-seal.net and we'll help you get started right away! Hi-resolution, full color (.PDF) files ready for print reproduction. All print materials are customized for your specific location and contact information. We will provide you with the print ready artwork and you can print as many copies as you need at your printer of choice. (Print costs are not included) Click on links below to view materials.